How It’s New York: Irish Repertory Theatre is one of New York’s best Off-Broadway companies (for my money, one of the best theatres in the country, and I’ve seen a few), and Fallen Angel Theatre Company is also NY original. How It’s Irish: Playwright Charlotte Jones is British, and Aedín Moloney is Irish (Paddy Moloney of The Chieftains is her dad). Airswimming has been extended until Sunday, Feb. 17. Don’t miss! Read Kathy Callahan’s interview with Aedín and John here! This review was originally published in Irish Examiner USA, Tuesday, Jan. 15. It’s what helps human beings bear the journey from the cradle to the grave while they wait for Godot, or something. So says Charlotte Jones, in her fine, haunting play Airswimming. 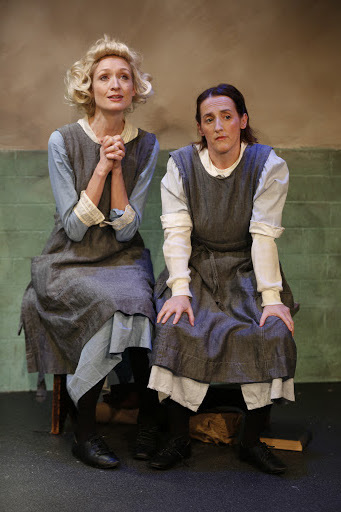 The U.S. premiere of the 1997 play, Jones’ first, is presented by Irish Repertory Theatre in association with Fallen Angel Theatre Company, Inc., opened on Sunday, Jan. 13. In Airswimming, two women, strangers who are not at first inclined to be friends, find in each other their only reason to go on. In their case they are waiting to be let out of an asylum for the criminally insane in 1920’s England, where their families have placed them as “moral imbeciles.” Just when you think you’ve seen the last of these types of stories, such as those of the Magdalene Laundries, here comes another. 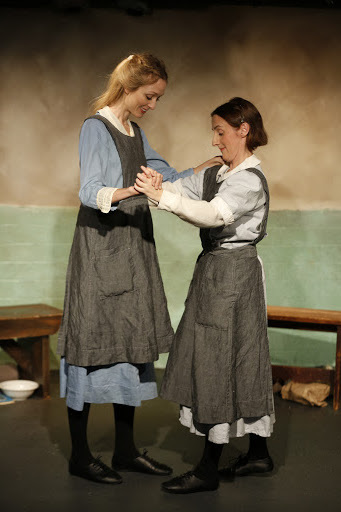 But as directed by John Keating, the two-hander starring Aedín Moloney, who is also the producer and artistic director of the company, and Rachel Pickup, there are a lot of laughs along the way. Complete in 75 minutes without intermission, it’s a simple and intense story with just two actors and one sparse set (Melissa Shakun). There are so many sweet moments and funny insights that you forget at time that the women are stuck in a sort of limbo. The distraction from the bleakness is not unlike life, maybe. The setting is not a conceit of Jones, who zoomed to fame with her play Humbleboy in 2002. Women really were warehoused, like the eccentric Dora (Moloney) and the fragile Persephone (Pickup), for having children out of wedlock, and left to rot. Press materials tell us that the story is based on the true story of Miss Kitson and Miss Baker. Eventually they will be let out, and cared for by the government-this is not a spoiler, it’s in every description of the show. But after 50 years, that long and strange life has become what is normal for them. The play goes from 1924 to 1972, going back and forth in time so that we know early on that the hopes of the sweet Persephone that she’s just been sent to “convalesce” are empty. We know that these two oddballs who are clearly not insane are going to be in St. Dymphna’s Hospital for the Criminally Insane for half a century, in Dora’s case. Dora arrived two years before Persephone. The two women are thrown together for an hour every day to scrub the bathtub and stairs. Persephone looks like a wounded swan, a princess in a fairytale. It’s a nice visual gag that the fragile Persephone towers over the blustering Dora. Early on Persephone still believes she will still have a coming-out party at the Dorchester. She’s only 21. It’s a shock when in the next scene when she’s wearing a short blonde wig, her Doris Day wig, singing and dancing and talking about a question about an actress from the ’50s. She and Dora call each other “Dorf” and “Porf” in the scenes set later. The odd rhyming names feel Beckettian, and we enter into a world of confusing wordplay and oddness sometime in the future. We watch as the 20s turn to the 30s, as Dora begins to lose her bravado and Persephone begins to talk faster and confuse her memories as the years of abandonment take her away from the moorings of reality. Her backstory includes an affair with a married man, a baby who is taken away and her father bringing her to St. Dymphna’s. Dora’s story is more confused; she talks of being accused of being a witch, of smoking cigars, and later of bastards herself. The two women practice “airswimming,” synchronized swimming through the air instead of in a pool, in dancelike moves that show all the life, yearning and beauty they maintain throughout their thwarted lives. Gradually Persephone becomes almost like Dora’s child, begging for a cat from a wry, long-suffering Dora who changes the subject to distract her flighty charge. Persephone also becomes completely obsessed with Doris Day, singing her songs and relishing trivia about her. Dora prides herself on being good with numbers and years, a trait hat allows her to tell us the history of Dymphna, the patron saint of the mentally ill, who was raped by her father and starved herself to death. She loves to talk about women who dressed as men. Dora also tells Persphone the history of the goddess she was named for, who was carried off by Hades, and whose mother Demeter made a bargain to have Persephone back for half the year. But Charlotte Jones’ story does. John Keating directs with clarity and depth, modulating the abrupt shifts from comedy to pathos skillfully. Keating keeps the intensity up and shapes the play nicely so that it never becomes too repetitive, despite occasional repetition in the writing as we shift back and forth in time and go from scene in the past to scene about Doris Day again. Seemingly much stronger than Persephone, as Dora, Moloney shows a heartbreaking vulnerability under the martial swagger. Her understanding of her predicament makes it that much more agonizing. She’s also very funny when she deadpans. Her Persephone appeals to the heart, then copes with an awful reality by swimming into a lunacy that is close to the pools of madness. She’s high-spirited, and stronger than even she realizes. 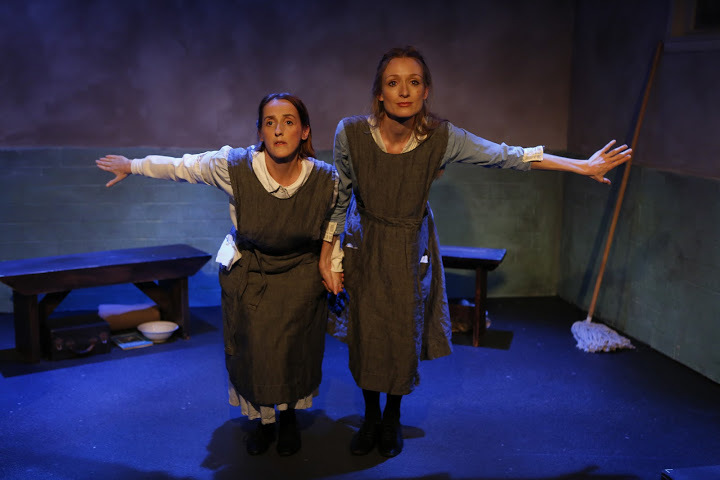 This is the best outing yet from Fallen Angel Theatre Company, whose mission is to present outstanding new Irish and British plays by and about women. Airswimming is the story of two women who find their only solace and hope is in one another. It’s not about women at all: it’s about everyone.